Sing through-me your song. Guide me, Teach me, Reach me, Heal me. I have been feeling a deeper and deeper calling into my shamanic path. It has been so rewarding these past couple of years of formal studies and regular practice. I know that the journey has just begun, for this life at least, even though I feel such déjà vu with all that I’ve learned and experienced. Last weekend, I learned about the death rites, a sort of shamanic, spiritual version of hospice, to help others to transition into the next realm, and to support those who are witness to the transition. There are also powerful variations to support those here now and going through powerful transitions in their lives. And, let’s face it: who isn’t? I can’t wait to share these powerful healing strategies with others. I already feel how profound they are for my life. In this blog post, however, I want to share what I experienced the weekend before last, when Dana and I, plus our dear friend, Laura Plato, attended a sacred drum-making workshop. In addition to making our own drums, we took a shamanic journey to meet and honor the “parents” of our drum, the spirits of elk and maple. 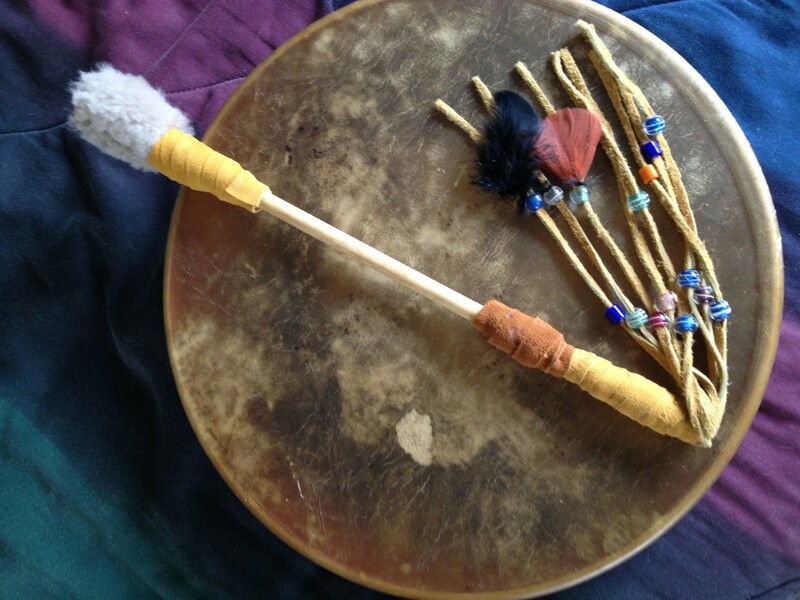 We learned the sacred responsibility of being a drum keeper and the healing powers of drums. The workshop was offered by Cindy Green of Drumheart. We opened sacred space, calling in the powerful archetypal energies of each of the four directions, of the earth and of the spirits of the sky. We offered thanks to the spirits of elk and maple, to the earth who offers nourishment and growth, to the sky who brings us warmth and rain. Then we began to create with our hands. 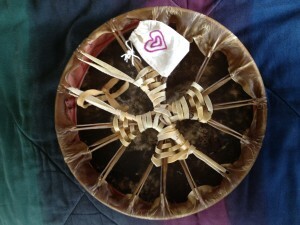 In the inside of the maple frame, we drew whatever we were called to create in order to add medicine to our drums. I added Reiki symbols, love notes for elk and maple, hearts, rainbows, and more. I wrote key words as guided, “sage spirit,” “service,” “joy,” “abundance,” and “creativity.” I painted a symbol smear of elk’s blood with red ocher, and then added a thin layer of ocher to the entire inner rim. We also added herbs to a little pouch to add to the drum’s medicine. I added symbols to this too, a double-heart on one side and an infinity symbol on the other. The drum very much symbolizes the feminine, the heartbeat of the earth. To create balance, we also constructed our own thumper (???). I am at a loss for the word, for I don’t want a “beater” to “beat” my feminine drum. I call forth a gentler world! Beads and feathers add beauty to the utility of my thumper. Then we began to work the elk hide. 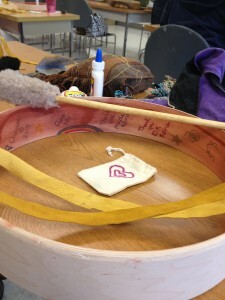 After stretching the skin onto the drum, we strung it into place with elk straps, and then created an elk handle in the form of a cross on the back. I knew for weeks going into this workshop that I would struggle with this part as a vegan-mindset person and a vegetarian (some fish and dairy) for over twenty years. The smell of the hide really brought up my aversion to using animals for our own thriving and pleasure. I know that this is a particularly complex issue in our culture, but for me this created an even greater calling into a deeper vegan lifestyle. Still, I have complete and utter gratitude to the spirit of the elk that provided a deeply significant part of my drum. I know too that the maple sacrificed just as much. Throughout the journey, Cindy would tell stories of her travels, visits, and journeys with tribes of North America. She told us this story, gifted to her by The Northern People. We were lazy one month and didn’t bother with them. The Spirits got angry and took them away. We were silenced except for our tongues and brains. Without the Drums we forgot how to Listen. Our Hearts and our Minds grew crusty with lack of use. Our Power declined. We lost our ability to communicate. Our bodies forgot they had spirits. Our spirits forgot they had bodies. We got Lost and started believing we were machines, so we built other machines to pass the time. We became surrounded by machines and thought they were our Brothers. We had no Sisters, but we didn’t know it mattered. Since we thought the machines were our Brothers, we let them advise us. We thought they knew more than we did. We did everything they told us. We forgot how to Breathe. We had to struggle to be happy and we were confused about love. We tried to kill or stifle anyone who didn’t act like a machine. We treated our bodies like machines and they began to break. We tried using tools to repair them, but it didn’t work. We grew Old but we didn’t Die. We just divided and multiplied until we filled up the whole planet. We began to Suffocate. Then the Spirits took pity and returned the Drums. At first we thought they were toys. We used them with our sound machines. But gradually their Power seeped into the backs of our memories. One by one we learned again how to use the Drums. We returned to our Circles. We resumed the playing. The rhythms began intertwining again. Slowly we remembered how to Listen. Our Hearts limbered up and began Loving of their own accord without the brain to organize and confuse. The brains took a much needed Rest. The machines fell into a cold, brittle Sleep. Our Spirits began to Touch each other again. We found the Sisters again and our bodies woke up and Remembered how to Die. With the return of Death our Powers came back in full. We used our Tears and the Blood of the Sisters to Heal the damage we had done when we thought we were machines. The damage was immense and almost irreversible. But the Spirits returned with the Drums just in time. Just in time. And now it is for my drum to teach me everything. I open myself to her song. I invite her song to flow through me for the greater good of all. Aho! This entry was posted in Conscious Evolution, Healing, Spirituality and tagged healing, Native American spirituality, sacred drum. Bookmark the permalink. I love synchronicity, Cindy, and I am happy to see you here. My drum and I have incredible adventures, and several friends love to play her too. What blessings! I am honored, Cindy, as always. This explains why I’ve been acting just like you described except I don’t understand why this is happening to me.? Anthony, you are welcome to contact me if you want to talk a bit about your experience. Love and blessings, Dear One.